We are in business to serve you and, we offer the highest quality chauffeured luxury transportation in the form of limos and party buses. However, you'll find that we do more than simply provide services for a wide array of events. We provide an unforgettable experience that provides you confidence and comfort from the very first hello. You see, we look at our purpose from a broader perspective than simply providing transportation. 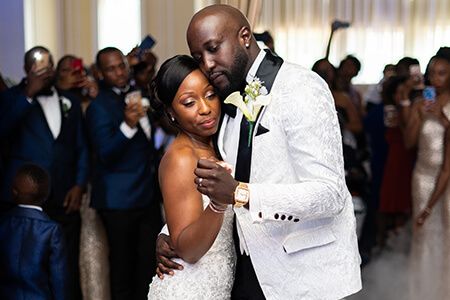 While yes, we do provide you with a highly luxurious set of wheels... We realize that you are entrusting us for some of the most important days of your lives! This motivates us to deliver a memorable experience to you that extends further than simply taking you from point A to point B. You will be treated with the utmost class, and our outrageously awesome vehicles are simply icing on the cake from there. Honestly, you deserve nothing less! We've provided exemplary luxury transportation services for nearly every occasion imaginable. From weddings, bachelor(ette) parties, proms and onto the business world as well. Providing services ranging from very important corporate functions to the more enjoyable company parties and celebrations. Don't forget too, that you may not need a special occasion at all to enjoy our service as we often get invited along to play host to a group of friends going out and just have a good time with food and drinks. We really do, do it all! How do we go to such lengths to provide this excellent experience? We owe everything to the great employees who work with us on a daily basis. Our garage staff is hands down the best in the business. Our client services team is not satisfied unless you have been fully taken care of, and are completely confident in your decision to work with us. Last, but not least, our chauffeurs are simply the difference makers. They are the ones who go to great lengths to guarantee your event goes smoothly and without a hitch. They're the consummate pros, and are proud of the great service they provide. If you're interested in finding out more about Limos Flint, by all means, check out the entire website. We've gone through painstaking detail on the website in order for our past, potential, and future clients to find out more about our company, or services, and what we do. Our number one priority when providing transportation for your wedding day is to ensure that everything goes smoothly. A stress-free wedding day is a great wedding day and we'll do our best. Ask us about our wedding packages today! 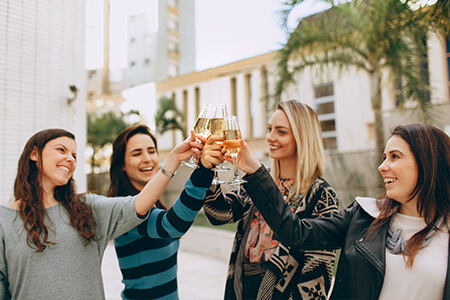 If you and your friends are going bar hopping or clubbing and don't want to separate or split the party up, then rent one of our fine limousines or party buses to transport you and you'll be side by side with your best friends all night. Girls night out. Sometimes the girls just need to get away from the guys and have a little bit of fun on their own. Is that too much to ask? 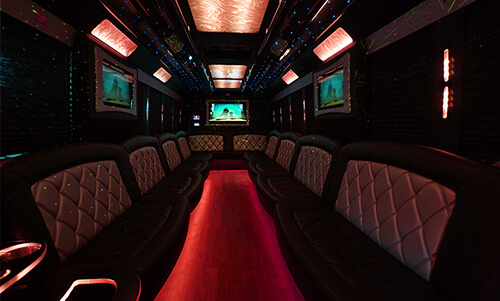 Ask about our pink party bus and we'll see if we can help you with your plans. Heading to a concert is a fun time but it can be a little bit arduous. Instead of wasting your time in traffic in a car for two, why have a few drinks and party all the way to to the venue where you'll see the show. 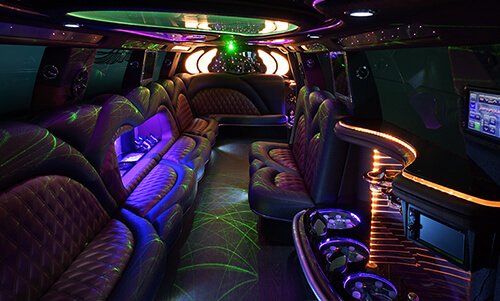 We have one of the largest fleets of limos & party buses in the state of Michigan. More importantly, however, we are proud of the way we meticulously maintain and keep our luxury vehicles in the utmost clean condition. We really aren't boasting when we say that we have the very best crew in our area. It's simply fact. Our mechanics and detailers are the heart and soul of what we do, and their steadfast dedication to ensuring each and every vehicle in our garage is perfect, really is a testament to them as professionals. They treat these limousines and buses as their own, and that is why they are a part of our family. They're not satisfied unless you are 110% happy with the condition of your rental. You may have found other companies out there who claim to have the biggest fleet. While yes, they may have a few other different vehicles than us. But, we can guarantee that they are not maintained better. We simply do not rest in our efforts ensuring that you get a luxurious experience. Our daily effort includes our endeavors to guarantee the cleanliness and operating condition of the vehicle you spend your hard earned money on. You don't have to put your trust in us when we say that our vehicles are top-notch. Put it to the test! We believe in this so much, we have a 100% open door policy in place for you. We extend a cordial invitation to anyone who would like to come in and see, to stop in and take a look before you put down a deposit. Please note that while you're welcome to stop in and check out vehicles at any time, we do ask that you call and let us know that you're coming. Oftentimes you'll find that we are out of the office on business so, we wouldn't want your visit to be for naught. Our Escalade Limousine features a white exterior with dark tinted windows and luxe jet doors. It also offers colorful lighting accents throughout the interior of the vehicle. 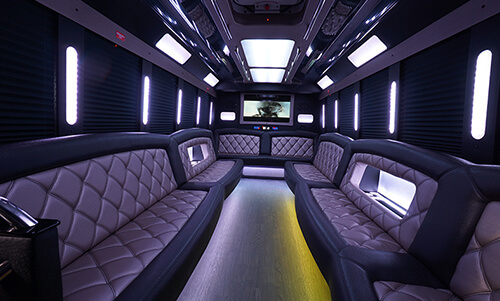 This party bus features hard wood flooring, multiple televisions, a dancing pole, and gorgeous leather accented seating for up to 28 people. This is an awesome vehicle so call to book today! Our 34 passenger party bus is a hit when it comes to all types of outings. This vehicle has deluxe leather seating, floors, lights, stereo, and so much more! It's spacious and exciting!